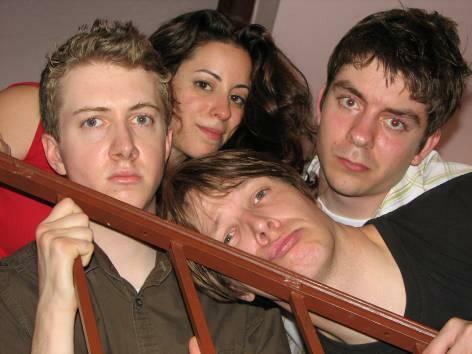 From left: Tim Girrbach, Alicia Levy, Marcus Bonnée and Rodney Umble. The Drop Six sketch comedy group, which just completed two shows at the People’s Improv Theater, fully realizes the comic potential of its premises, with gifted performances and skillful direction. Alicia Levy stands out as she plays the lead in several of the group’s sketches, but the other three members, Rodney Umble, Marcus Bonnée and Tim Girrbach, all display distinct comic personalities and are indispensable in supporting her. Girrbach in particular can do a lot with a little, as in a sketch where he and Levy play hot-blooded Spanish lovers. Girrbach hides behind a oily black wig and mustache but commands attention with very little dialogue. Similarly, in a showcase piece about awkward teens at a school dance, Girrbach mesmerizes as a particularly dorky teen with twitching lips and closed eyes, who seems to be expecting a girl to kiss him any second. Levy shuffles in, playing against type as an equally awkward girl who’s still turned off by him as well as Bonnée and Umble as glasses-wearing misfits. But with all the guys over-confident, the sketch works as a dork version of the Roxbury Guys from SNL -- something that works with very little dialogue. All the members of the group are relatively young, and in sketches like this one, they benefit greatly from direction by Larry Rosen, a 12-year veteran sketch comedy director (with still more years of overall theater experience), who no doubt guided them to the right notes here. Bonnee also helps make the school dance sketch without overshadowing Girrbach and Levy, as his character repeatedly trips over his own two feet, taking himself out of the running. All in all, the sketch highlights the group members’ good rapport and how they play well and generously off one another with no one taking the spotlight for too long. Levy of course deserves special mention however as she earns it with the show closer, a Bat Mitzvah girl’s speech -- first capturing all the well-known tics of a 13-year-old delivering the required clichés to keep the family happy and amused, but then taking it in an unexpected direction to bring the house down. Too often, shows that excel may only get a short run in the city’s alternative comedy venues, which barely gives anyone time to discover them, but Drop Six is one that hopefully will be back again soon.